If you’ve got a webinar that leads to a high-ticket program, coaching or services, we’ve got the funnel HACK that will increase your sales (by 5-10 percent!). It’s no secret that webinar show up rates are on the decline. That doesn’t mean, though, that people don’t want or need your high-ticket item! It means they don’t have time to wait for your sales pitch. Here’s what you can do about that (i.e. how you can sell that high-ticket item regardless!). Today’s episode will be pretty short and sweet, but I think it’s going to have a lot of value for you guys. 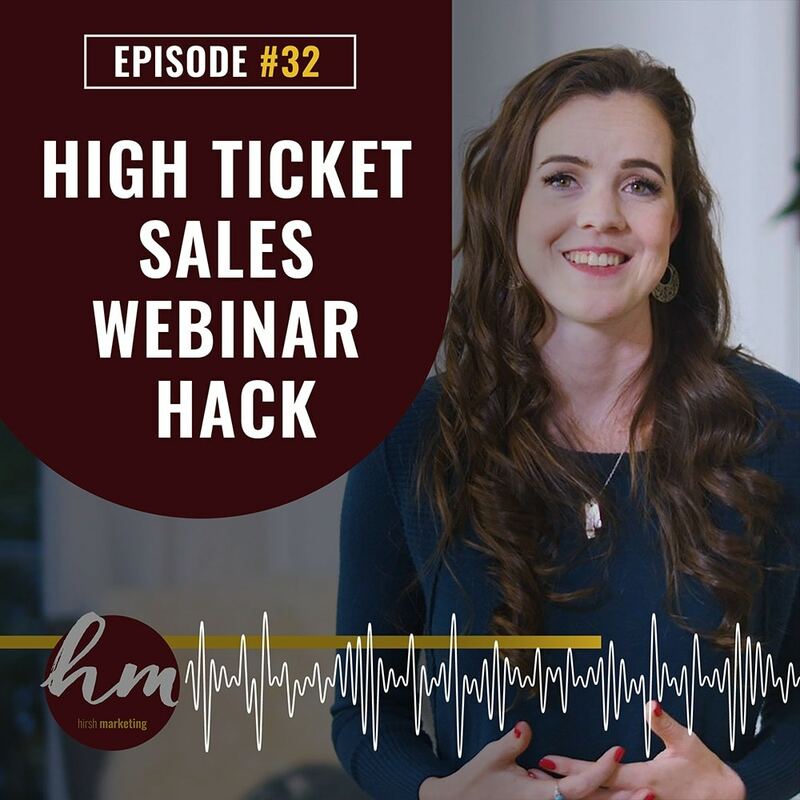 This is a high-ticket sales webinar hack that we’ve been testing and using for a couple of months now, and it’s been really effective. 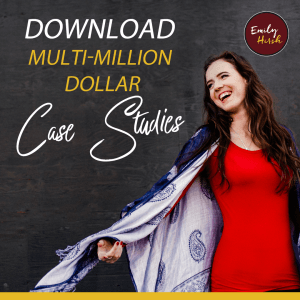 So, high-ticket sales, meaning your ultimate goal from your webinar is to get somebody on the phone applying for your program, or coaching with you, or your service, and that’s your call to action on your webinar. I can’t actually take full credit for this strategy. I don’t know who invented it first, but I know that I heard it from Taki Moore in his mastermind originally. I have a client and friend who’s in there who went to their mastermind, came back with the strategy. We tested it with ads to his webinar, and it was working amazing, so I rolled it out to other clients. I’ve seen a lot of people starting to do it, so I always want to be clear when I didn’t invent the original strategy. We have made some tweaks of our own that I think are really helping, but it’s an awesome strategy, and I feel like I really wanted to share it with you guys because it’s very effective. Basically, the strategy is if you want to get somebody on the phone, and the goal is to get them to apply for the [program or service], you actually put the option to book a call on the thank you page of your webinar. You have that option, as well as obviously pitch it on the webinar. The flow basically goes, “Sign up for my free training,” and then on the thank you page, it’s like, “Don’t want to wait for the webinar?” because here’s the thing with high-ticket. If somebody has the money to buy high-ticket, which is who you should be targeting. Your ideal customer, it’s getting harder and harder to get them to sit through a webinar. They might still sign up for one, but it’s getting harder for them to actually sit through one. By putting the call to action to actually book a call on the thank you page and positioning it as, “Don’t want to wait for the webinar? Jump right in, take the next step here, book in your free …” We don’t just say call, like, we’ll call it a strategy session or breakthrough session. Whatever you call it. Now, the other thing that I have my clients do is make a video for this page. I think it’s really important that a video’s on this page that explains what they’re going to get on the session, and encourages them to take that step if it’s right for them. But also, making sure that you only attract the person that it’s right for to book the call. What you don’t want to do it position the call as this free, awesome, valuable thing that anybody can go to. You want to be specific with who you want to book the call because we still want quality. That’s every high-ticket person’s number one problem is “How do I get quality leads and not just quantity, but quality too?” By doing that, you want to make sure that the video connects with you and makes them see value, but it almost serves as like, okay. It was the fastest track webinar video that they needed to watch to connect with you and know I might want to work with this person. I’m just going to book in this call. I think it’s essential that when you do high-ticket funnels, whether you have this on your webinar thank you page or not, that when you run high-ticket funnel traffic, that the people getting driven to this webinar are warm. Because if you’re driving somebody to a webinar and then you’re trying to get them on the phone to pitch a $10, $20, $30,000, or even $5,000 product, most likely, 8 or 9 times out of 10 does that person need to have known about you, heard about you in some way before they get to that webinar to have the trust to buy on the phone. How this is working really really well is by using what we call our new waterfall strategy for clients. We rolled this out a couple of months ago. My Internal Strategic Advisor, Mia, on my team is amazing. We basically, between Mia and I, we create trainings for our existing ads team and new strategies that we roll out all the time for clients. One of our big ones this quarter was the waterfall strategy, which essentially builds in very very strategic videos directly on Facebook that send people through a waterfall, we call it, of content before getting to the webinar. The key is what the videos consist of and how strategic they are, and then how we send people through. Basically, they don’t get to the webinar ads until they’ve seen a few forms of content that we strategically wanted them to see beforehand. This is different for every client, what that content is, and how many layers there are. I customize this on the strategy call because for some people, seeing a case study or a story about their client’s success actually makes sense before the webinar call to action because that gets the lead super excited about possibly working with them or learning more about them. For some people, that doesn’t make sense, and it needs to be the specific content that we need to strategize. The key here is if you’re going to do high-ticket funnels at all, like, high-ticket webinar funnels, I believe more and more, like, this is becoming true more and more every day too because of the saturation of it, but I believe that you need to be driving 95% warm traffic to that funnel, if not all, warm traffic. Because then you’re getting quality leads who are ready to buy. It’s easy to sell to them because they’re already a follower, they’re already a believer. They already know your content, and that’s what’s getting people quality to book the call in on the thank you page without having to go to the webinar because there’s already some form of trust built with you and your brand. That’s the little secret spin that we put on it because we were already doing that with high-ticket webinars, or really, webinars in general. Again, very customized for the brand, very customized for the strategy, because I hate cookie-cutter strategy, so I’d never say this is true for everyone. But for most people, we’re building in this waterfall strategy before a webinar, and we’re getting sometimes double the results as what we were getting before because people are more committed by the time they get the webinar ads. It’s amazing. If you have a high-ticket webinar funnel, try out this thank you page call to action to Book a Call on the thank you page. What you need to look at is, obviously, the volume of calls. Does that go up? But quality, quality is huge here. Step 5 in the Hirsh Process is scale and optimize. That’s where you should be tracking. What’s your cost per call, and then what’s your conversion number of those calls because if that shifts at all when you make a change like this, you have to see, was it a good or a bad shift, and by how much? That is my high-ticket sales webinar hack that I absolutely am I loving. I think it’s brilliant. I think it’s how we have to shift and adapt as the market changes with a saturation of webinars. Webinars are still extremely effective, but when you sell high-ticket, you’re selling to a higher-level client, and you need to have that in mind when you are running traffic to the ads. 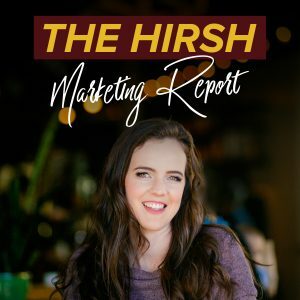 If you guys found this helpful or you really want … You’re like, “I need someone to implement this waterfall strategy for me or a high-ticket webinar strategy for me,” go to helpmystrategy.com and apply to work with Team Hirsh. Thanks so much for listening today.